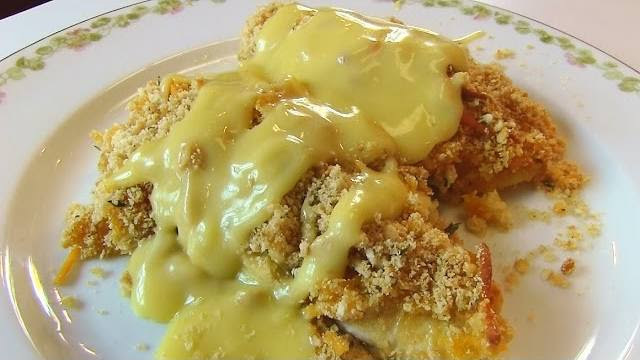 Pour the milk, cheddar cheese, and Ritz cracker crumbs into three separate shallow pans or dishes. Stir the salt, black pepper, and parsley flakes into the Ritz cracker crumbs. Dip each chicken tenderloin individually into the milk, then the cheddar cheese, and finally the Ritz cracker crumb mixture. When dipping into the cheddar cheese and the cracker crumbs, press chicken firmly, so that it picks up as much of each coating as possible. Place the coated chicken tenderloins into a 13-inch by 9-inch by 2-inch baking dish that has been sprayed with cooking oil spray. Cover with aluminum foil and bake at 400 degrees (F) for about 30 minutes. Remove aluminum foil and continue to bake until cheese is melted and crumbs are beginning to brown, about 5 minutes. While chicken is baking, make gravy: In a small saucepan, stir together chicken soup, sour cream, and butter. Place over low to medium heat, cooking and stirring until butter is melted and ingredients are combined and hot. To serve, place cooked chicken tenderloins on nice plate and drizzle gravy over the top.